For the rest of this article, I’m going to talk about newsletter templates. However, I think you’ll see that the same techniques can be used to design other types of documents. 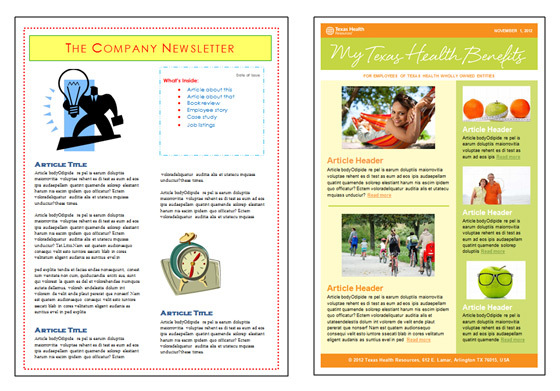 Take a look at these two newsletter templates, both designed in Word. Which looks more professional? I hope you chose the one on the right. However, a large number of the internal newsletters I see look like the one on the left, even though it only takes a little more effort to create the one on the right. The two templates above are very similar, structurally. They both have a masthead at the top, then two columns of text and images. The one on the right uses a table for its structure, as opposed to text boxes and Word columns. The table is what makes it easy to add the colors and elements that make it attractive. Then I applied background colors to each row and column. Right-click and click Select, then Cell. Right-click again and select Borders and Shading. Click the Fill Color dropdown. Word will show a list of standard colors that you can select from. However, you are not locked into selecting one of these! By selecting More Colors, then clicking the Custom tab, you can create any color you desire. Finally, I removed the black borders. Right-click and select Borders and Shading. On the Borders tab, click the None box in the left column. For the article headers on the left, I redefined the Heading 1 style to look the way I wanted it to. Then I created a new style (Heading 1 Right) based on that one, but I changed the color. I also created a few new styles for Date, Description, Footer, Links, etc. You’ll notice that a big difference between the two versions is that one uses photographs and the other uses clipart. Clipart is extremely popular with non-designers, but you’ll very rarely see designers use it. That’s because it’s almost impossible to make a document look professional using stock clipart. That said, I understand the temptation to use it. A newsletter or flyer without graphics can seem boring and unfriendly. But please believe me, when it comes to looking professional, a design with no graphics is preferable to a design with bad or cheesy graphics. And using multiple cheesy graphics that clash with one another (different styles, colors, etc.) is worst of all. Ideally, you would have access to good-quality photos of real employees and events to illustrate your newsletter, and I urge you to aim for that. But if that’s not possible, inexpensive stock photography is a decent compromise. Shutterstock, Dreamstime and iStockphoto are a few low-cost sources. If you use stock photography, try to choose images that work together visually (use similar colors, lighting, etc.) and don’t clash with your overall newsletter design, your subject matter or your company’s brand. Most of the time, you’ll need to resize photos after you’ve dropped them into your template. You probably know that you can resize a photo by clicking on it and dragging one of its corners. What you may not know is that if you hold down the Shift key while you drag, the photo will keep its original proportions. That will prevent the stretched, distorted look that’s often seen in resized graphics. Sometimes only part of an image is relevant, or you simply want to focus more on a particular piece of the image (such as a face). Many people think they need a tool like Photoshop to crop an image, but Word’s Crop tool actually does a perfectly adequate job. Another big difference between the two examples above is that the version on the right only shows a few sentences for each article, but it has more articles on the front page. If a reader is interested in reading the rest of the story, he/she can click a “Read more” link to go to the full article. This is a technique you’ve probably seen in blogs, and I recommend using it for newsletters as well. You’ll notice that my template doesn’t contain a table of contents. That’s because all the teaser articles fit on the front page. If you have more articles that will comfortably fit, you’ll probably want to add a table of contents. With this design, I’d probably place it at the top of the right column. When selecting fonts, you need to be aware of how the file will ultimately be distributed to employees. Otherwise you run the risk of having the file look very different (and far less attractive!) on other peoples’ screens than it looks on yours. You must stick to fonts that you know are installed on every user’s computer. Otherwise, your users will see ugly, default text and “missing font” warnings. If you wish to use a decorative font for a masthead, as I did in my example, you’ll need to create the masthead as a graphic instead. If you plan to convert the file to PDF before sending it to anyone (and this is nearly always the best way to distribute your files), you can use any font you wish.